The largest chateau in the world holds a thousand and one secrets, even from those who know it intimately. Versailles has been described in minute detail since the reign of Louis XIV, but numerous rooms in the palace and its outbuildings are inaccessible to the public due to their fragility or state of preservation. From the most renowned salons to the gardens explore the full range of beauty of this infamous chateau with Versailles: A Private Invitation. Brimming with hundreds of years of history, this book includes previously unseen material on the recently restored Cabinet de la Meridienne, the Salon d’Aurore as well as new, up-close objects that are not part of the general public circuit. Detailed look at the largest chateau in the world. 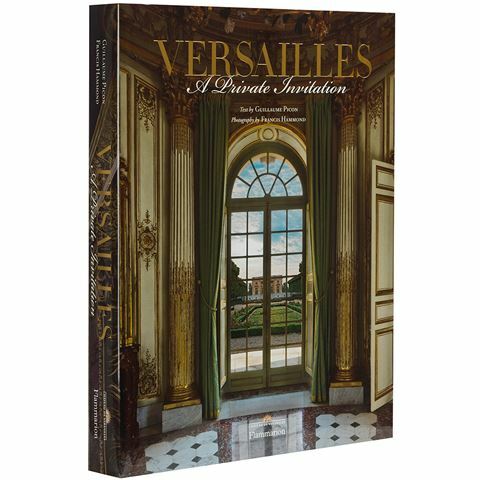 Explores every facet of Versailles including the King’s Suite, Marie Antoinette’s Private Rooms, The Gardens of the Chateau and much more. Includes a foreword by Catherine Pegard. Introduction penned by Laurent Salome. Bibliography, quotation sources, index, acknowledgments and photographic credits at the back. Dimensions: 25.5cm (l) x 31.5cm (h) x 3.7cm (w).